Officials at Park Place Infiniti are awaiting the September arrival of the 2017 Infiniti Q60 coupe, which features a new V-6 twin-turbo engine and was called a “head-turner” by car reviewer Edmunds.com. 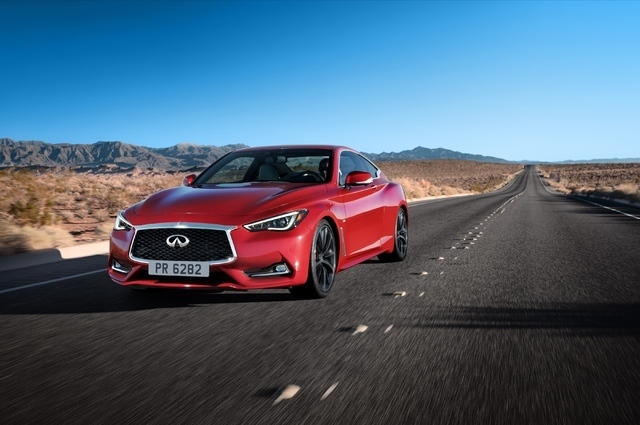 COURTESY The 2017 Infiniti Q60 coupe arrives this September at Park Place Infiniti, 5555 W. Sahara Ave., with a celebrated and all-new V6 twin-turbo 400-horsepower engine that promises peak performance. Auto industry reviewers are noticing. Car and Driver puts this model on its list of “25 Cars Worth Waiting For,” calling it “gorgeous.” Kelley Blue Book lauds its “edgier style and stronger performance” for providing drivers a full-range experience. The 2017 Infiniti Q60 features Infiniti’s trademark Direct Adaptive Steering, dynamic digital suspension and expressive illumination. The steering system digitally and instantly transmits the driver’s steering movements to the wheels, without a mechanical connection. Its digital processing power allows for quicker, smoother steering. When driving on rough or uneven roads, the system automatically makes subtle adjustments to give the driver an increased feeling of stability, while decreasing feedback and vibration through the steering wheel. With its digital suspension system, this model lets drivers change from comfort-biased to dynamic ride with the push of a button. The Q60 coupe’s illumination system incorporates “eye-inspired” headlights and a double-arch grille. The model’s light-emitting-diode lights and Infiniti’s optional adaptive front lighting system, give drivers improved visibility at intersections and around curves. For more information or for a test drive, call 702-252-8100.